Experience Hot Wheels® racing like never before with the most immersive racing system to date! Hot Wheels® A.i. uses computer enhanced Artificial Intelligence to help guide your car around the track. Use your driving skills and launch virtual hazards, like oil spills and tire blowouts, to be the ultimate Hot Wheels® champion! Or race off-track with the standalone freeplay mode. Expand the race with additional Hot Wheels® A.I. 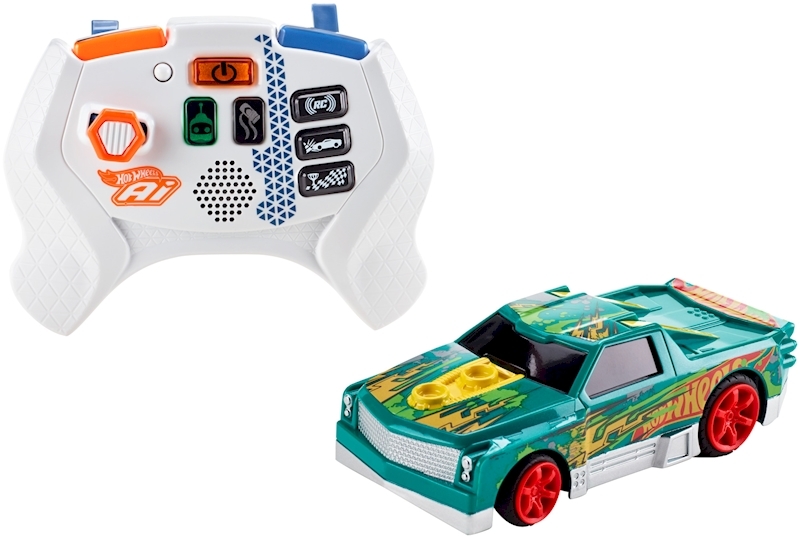 enhanced smart cars and controllers and join the Hot Wheels® A.I. race or race off-track with RC mode! Includes 1 Smart car and 1 gaming controller. Each sold separately, subject to availability. Also compatible with the Hot Wheels® Ai Starter Kit (sold separately). Colors and decorations may vary.